Survival at 70 stories is measured in seconds in Balancing Act. Do not play this game if you have a fear of heights. Do not play this game if you have a fear of falling. Survive for as long as you can on top of the tallest building in Vancouver, teetering on un unstable beam, braving vicious rain storms with killer balls of freezing death. Run, jump and dive your way to the top of the global leaderboard. This game could be hazardous to your health if you have anxiety about the effects of gravity on a 3D animated construction worker stranded on the tallest skyscraper in Vancouver, BC. This game could be hazardous to you if you have a fear of teetering on the brink of death or balancing on an unstable iron beam. A volcano erupts, raining fiery destruction! People are in peril, trapped in the valley by corrosive acid rain and exploding volcanic rocks, seeking refuge in the forest, in caves and in their cabins. You witness the devastation from your campsite in the mountains. 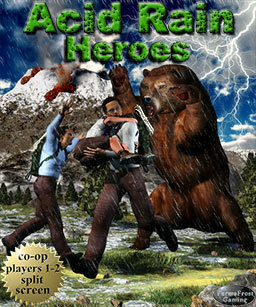 Acid Rain Heroes is the sequel to Acid Rain featuring 2 player local co-op, auto or user selectable split screen and several additional 2 player challenge missions.